It is so good to be back in the North Carolina Mountains. There is nothing more beautiful. Our timing for the trip back was perfect. The temperatures have been even warmer than in Florida. The only downside to being back is the amount of work that we are facing. Because of the brutal winter, we had to deal with cracked water pipes; no water for the first couple of days. There are leaves to be raked, downed limbs to be hauled, porches to be cleaned and fresh paint needed in several places. But one of the first areas I tackled was the upper porch. 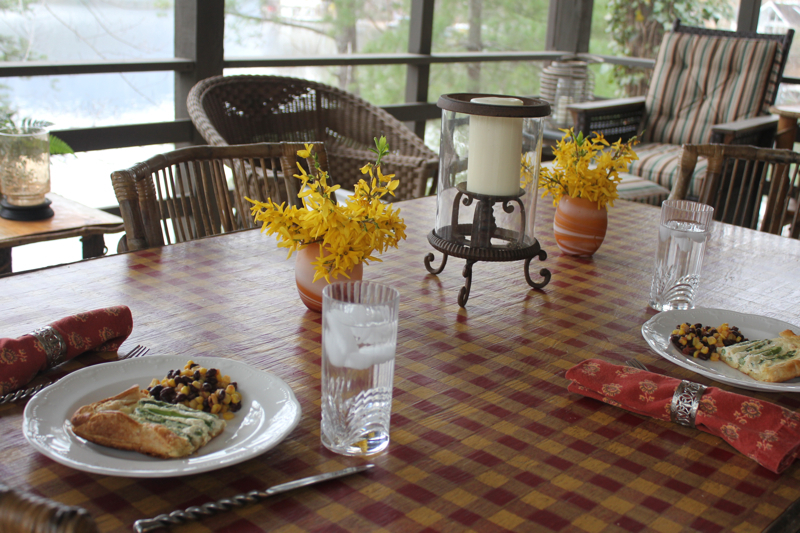 It is warm enough for meals out there overlooking the lake. 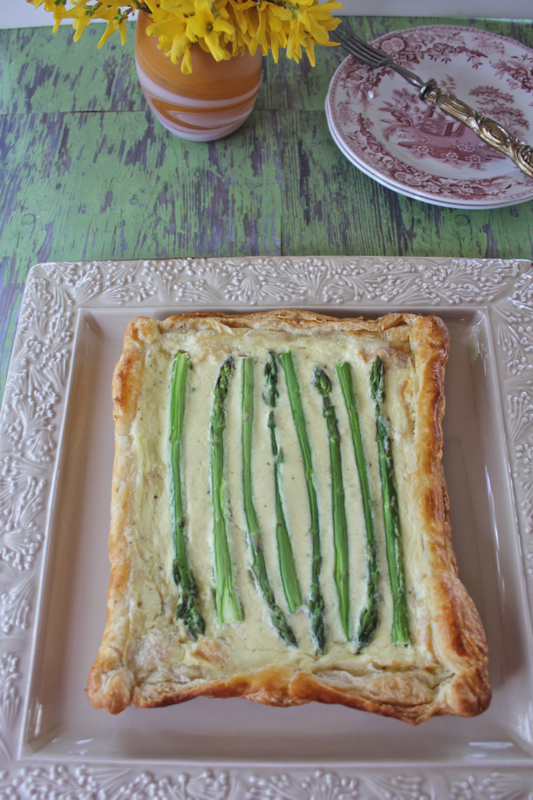 I made this asparagus tart for lunch yesterday to celebrate our good weather. This is very simple to pull together if you have sheets of puff pastry in your freezer. I found the recipe on Pinterest. It came from Nicole at Heat Oven to 350. You may want to visit her blog to see instructions on how to shape the pastry. The filling in the tart is a mixture of ricotta cheese, egg and cream. The asparagus is not blanched ahead of time, but if you have large stalks, you may want to consider doing it. Relaxing on the porch for lunch was a good respite from the tasks at hand. The asparagus tart was light and delicious. I served it with leftover corn and black beans with picante sauce. 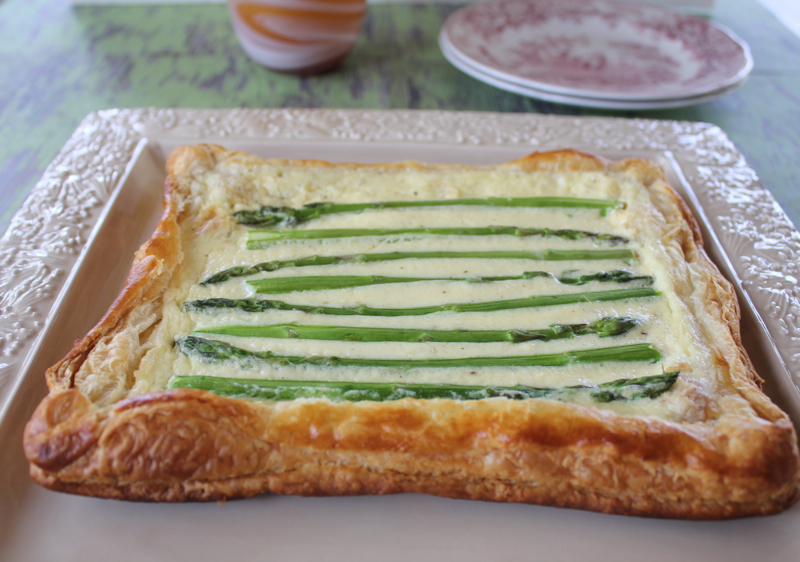 This was a wonderfully flaky tart with a mild and creamy filling that supported the vibrant green asparagus. The recipe makes two tarts. One tart can be cut into 4 pieces to serve four or if that is all you are serving, perhaps two hungry people. I halved the recipe to make this one tart. Adjust an oven rack to the lower position and hear oven to 375 degrees. Unfold each pastry sheet one at a time and, using a rolling pin, roll each pastry slightly to smooth out the seams and increase the size. Turn oven down to 350 degrees. In a medium bowl, beat together egg, ricotta, cream, milk, salt and pepper. Pour half of the mixture into each baked tart. 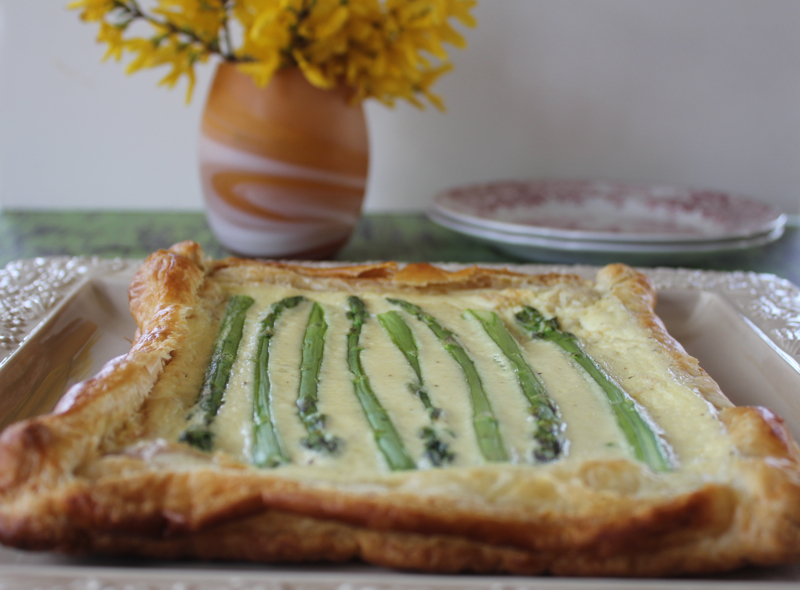 Lay half the asparagus on top of the ricotta mixture in each tart. Bake another 15-20 minutes or until golden and set. Serve hot or cold. Posted on April 3, 2014 at 9:45 am. The lake was as smooth as glass a few mornings ago and my husband took some pictures from our boathouse. It was so quiet and beautiful. Our neighbors to the West. The abandoned property directly across from us. There used to be a beautiful house here full of antiques and much history. It burned down over ten years ago and nothing has been done with the property. It has a lot of potential. Won’t you come and be my neighbor? The boathouse toward the East. This is our wizard that was carved from a fallen red oak tree. He keeps watch over our house. The mountain laurel in full bloom. Spring in the mountains is a glorious time of the year. Posted on May 18, 2010 at 6:01 am.